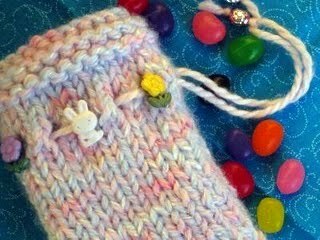 This little goodie bag is a fast, easy project and a great way to use up partial balls of yarn in your stash. It can be filled with candy or other delights and given to a child (or a child at heart). The bag is knit in one piece and then folded in half at the bottom and seamed at the sides. The finished bag is approx. 3" wide and 4" in height. 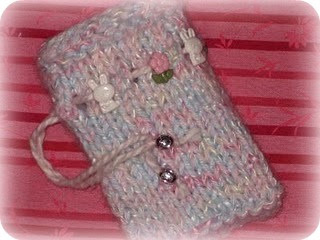 Although I designed this one for Easter, with a little imagination you could knit one for any holiday ... or just because. Six Easter or spring-themed buttons. The buttons shown were purchased at JoAnn Fabrics. Two beads large enough to thread on the yarn. Straight needles size US 8. Tapestry needle for seaming the sides of the bag. With two strands of yarn, cast on 14 stitches. You'll knit with two strands throughout the entire project. Knit four rows garter stitch. Starting with a purl row (wrong side), work five rows stockinette. You should end with a purl row. Knit the eyelet row: K1, *YO, K2TOG*, repeat. Knit the last stitch. Beginning with a purl row, work stockinette for three inches. Beginning with a purl row (wrong side), work stockinette for three inches, ending with a purl row. Knit the eyelet row: K1 *YO, K2TOG*, repeat. Knit the last stitch. Beginning with a purl row (wrong side), work five rows of stockinette. Cut a strand of yarn approx. 17 inches long and weave it in and out the eyelets, stringing the decorative buttons on it at regular intervals. Knot the two ends of the string together a couple inches from the end. Thread a bead on to each of the ends and secure it with a knot. Fill with candy or other goodies and give to loved one. Very cute -- thanks for sharing your little secrets! Cute bag! I know a child who would love one of those.